The 999cc four-valve Unicam® parallel-twin engine is a performance-tuned version of the platform from the durable Pioneer 1000 multipurpose side-byside and CRF1000L Africa Twin adventure motorcycle. Developed in Japan by Honda Motor, and produced at the Kumamoto plant, the water-cooled engine features a 270 degree crossplane crankshaft. 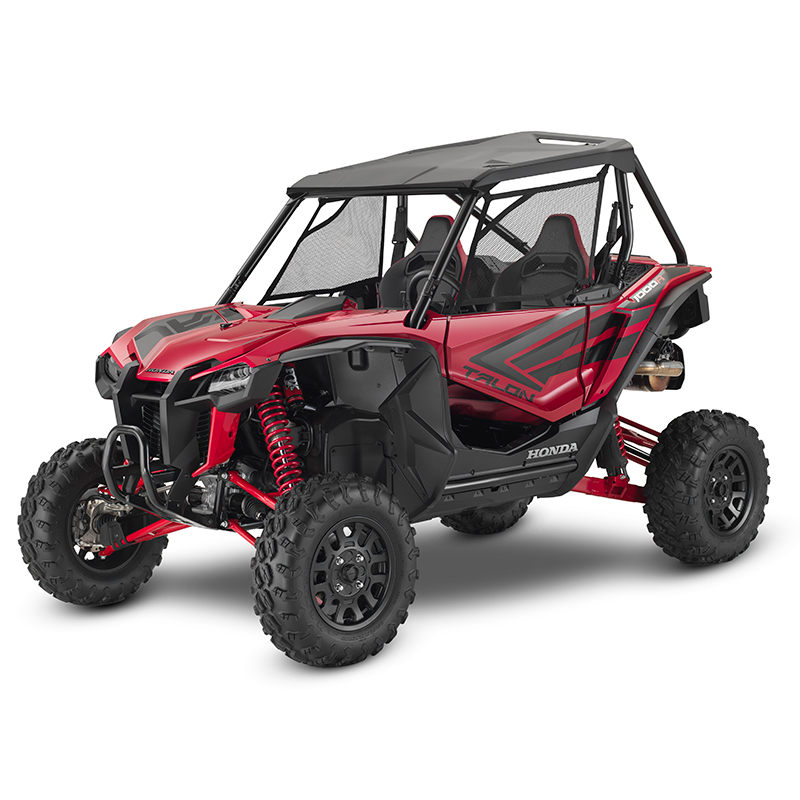 The Talon feature a frame and suspension components that were engineered and developed at Honda R&D America's Raymond, Ohio, campus, for a plush ride, maximum ground clearance and precise steering response. A 44% front-end weight bias is ideal for handling and a balanced feel as well as automotive-industry design concepts that bring a new level of engineering to the category. The Talon 1000Rs suspension and wheelbase are intended to emphasize high-speed tracking and large bump absorption; suitable for a broad range of terrain types. The all-new, one-piece frame was designed and developed incorporating Honda's vast off-road design knowledge to achieve optimum handling properties by maintaining appropriate levels of stiffness and compliance to retain consistent geometry even when pushed under the hardest loads. As a result, the vehicle behaves and responds predictability for a more controlled, confidence-inspiring ride. In addition, the frame undergoes a state-of-the-art process that includes an e-coat dip, oven baking, powdercoat spraying, and another oven bake, all of which guarantee the quality of the paint and ensure the rust-prevention needs are met. The Talon's silhouette is low, and minimization of bulk was a focus during development. (Approximately 25% of the vehicle's mass was shed during the design evolution.) Knowing the rigors through which customers would put the Talon, designers stressed efficient engine cooling, with motorcycle-inspired shrouds and four side vents, all of which are unique to the side-by-side world. The roof, which comes standard on the Talon, incorporates a front lip to keep moisture from reaching the interior (even when braking in rainy conditions), and a horizontal pass-through slit both creates a functional spoiler (providing downforce at higher speeds) and allows appropriate aerodynamics when the vehicle is towed on a trailer, whether it's facing forward or backward.